Things are messing up again on the isle of Curaçao, at the Isla refinery, with garbage collectors and teachers. The state no longer has any money, garbage collectors strike and block traffic with garbage that has been set on fire. Teachers strike because the schools are no longer being cleaned and they also block traffic. On Tuesday, 5 February, it will be announced that the 100-year-old refinery will not be taken over by the Motiva Enterprises oil multinational (probably American-Saoudic capital). That same evening, angry Isla workers move to the Fòrti government centre, which, according to the Dutch daily Trouw (1) , prevented ministers from entering or leaving. 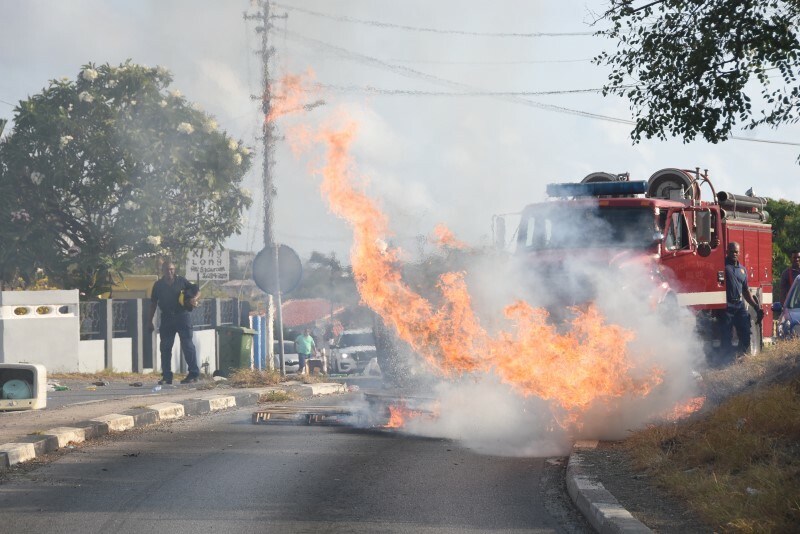 The next morning, large crane trucks block the capital Willemstad and car tyres are set on fire in front of the Isla trade union building. The actions are obviously political, directed against the state, which owns the heavily obsolete refinery. Earlier, in 2016, Chinese capital would invest the 2.3 billion dollars needed to renovate the Isla. This investor withdrew after China curtailed capital flight. The striking workers put forwards two demands. The first claim, the departure of Clift Christiaan who negotiated on behalf of the refinery with takeover partners. Christian would like to close the refinery. This demand of his deposition will be met on Friday. The union ends the strike despite the fact that the second claim, inclusion of unionist Errol Cova in the negotiating team, has not been accepted. According to the refinery because Cova would be on the payroll of the tenant and operator of the Isla, the Venezuelan state oil company PDVSA. Prime Minister Rhuggenaath even suggested that it are the unions that want to close the Isla. Cova is known to have sympathised at the time with Chavez' so-called Bolivarian revolution in Venezuela (2). The Prime Minister is not ashamed to respond to the petty-bourgeois island mentality, in which recently arrived migrants are mistrusted and discriminated against as 'foreigners'; Cova was born in Venezuela. Such allegations in all directions about the deliberate failure of the negotiations about a take over, are difficult to substantiate or deny. They mainly serve to confuse the workers. The refinery workers, however, react soberly: Venezuela has paid salaries every month. But at the end of this year, the lease of Venezuelan operator PDVSA expires, and it has now become clear that there is a good chance that the refinery will close. For almost a year now, production has been halted because American creditors are seizing tankers containing Venezuelan crude oil. The problems in Venezuela affect the proletarians on Curaçao in another way too: by the stream of desperate people escaping nearby Venezuela by small boats. The island of Aruba also has problems with its refinery and the flow of refugees. The Kingdom of the Netherlands, of which both islands are part, is ultimately responsible for the reception of refugees, but does nothing. It is a divide and rule play between the 'foreigners' and the native islanders, who, like everywhere in the Caribbean, all have families coming from elsewhere. Only when workers see that most refugees - just like all of themselves - have nothing but their labour to sell, and therefor have the same proletarian interests against the capitalists and their political accomplices, the divisions between them will end. Then competition can give way to unity in the struggle. The working class of Curaçao and Aruba, like those of the other neighbouring countries Colombia, Brazil, Guyana (and a little further Suriname), is directly involved in the human, economic, political drama that takes place in Venezuela. With respect to the paralysis of the working class of Venezuela, the complete lack of any movement of workers for their own class interests, the strikes on Curaçao are a ray of hope in an ocean of darkness. Why? Venezuela is facing economic and political collapse. Desperate proletarians lacking food and medicine are being mobilized to risk their lives for one politician or another. Either for maintaining the power of Maduro and the higher class of officers who have shamelessly enriched themselves. Or for support for the self-appointed president Guaidó, who, under the petty-bourgeois slogans of 'democracy' and 'freedom', hopes that the middle layers of the army will support him. This is not about preserving the 'socialist achievements' of Chavism, i.e. the crumbs of the prosperity produced by the workers, who were thrown to the poor in exchange for political support for Chavez and Maduro. Now that oil prices on the world market have fallen, there is a lack of food, petrol, medicines. So we see the failure of capitalism in Venezuela. On the other hand, Guaidó will not bring the restoration of capitalism, because it was always present, as was the influence of imperialism. Venezuela is just as imperialist as any other state, and it must join the interests of the stronger imperialist powers at will or in anger. This is now evident under Maduro in the privatisation of the 'national' wealth through their sale to Russia and China. Colombia and Brazil present themselves as regional imperialist powers and are considering military intervention in Venezuela. Even the other side of the world will be moved by an escalation of the clash between imperialist interests in Venezuela, as Erdogan of Turkey and Ayatollah Khamenei of Iran understand, who pretending to be 'anti-imperialists', come to the aid of the Chavists. And behind this inciting of inter-imperialist war, hidden behind a 'civil war', the United States, China and Russia emerge as protagonists of a world ripping conflict, which this time will not spare Latin America. A new Syria is in the making, in which the proletarians are invited to participate in armed gangs fighting for one imperialism or another. In this battle for their parts of Venezuela's wealth, Curaçao and Aruba will serve as airfields for the air force, as naval ports, as brothels for soldiers on leave, perhaps as oil refineries. The workers of Curaçao and Aruba are thus - just like those in other countries of the region - in a wasp nest of interests that are not theirs. In such an escalation of imperialist clashes, the proletariat awaits only more exploitation and oppression. For this reason, the initiation, expansion and upgrading of workers' struggles for their own class interests is now of the utmost importance for slowing down the trend towards war. An important step in this is the organisation in mass meetings of striking workers and of unemployed and retired workers, of working class pupils and students, the appointment by these meetings of representatives on the basis of a clear mandate and immediate re-election as soon as the masses wish. LONG LIVE THE WORKERS' COUNCILS! NO STRUGGLE FOR MADURO, NOT FOR GUALDÓ, ONLY FOR THE WORKING CLASS. LONG LIVE THE INTERNATIONAL SOLIDARITY OF THE PROLETARIAT OF ALL COUNTRIES. The struggle of our class can only take this direction if everyone who recognizes himself in this program, seeks contact with like-minded people in his or her environment and worldwide. Only in this way can a real vanguard of the clearest and most determined workers emerge, and ultimately the International of the world proletariat. Mail us. Distributes this text. See added PDF. (1) Trouw 9 and 11 februari 2019. See for daily news about the strikes Knipselkrant Curacao (mainly Dutch). (2) See previous article on Isla by Arbeidersstemmen, English version: A general strike starting from refinery workers at the caribbean island of Curacao – awaiting new masters from China. Portugese version: Greve geral em Curaçao e os novos patrões da China. • ¿En qué acabará la crisis venezolana?, How will the Venezuelan crisis end? • ¡Ni Maduro, ni Guaidó, sino lucha independiente y proletaria contra el capitalismo! With respect to the paralysis of the working class of Venezuela, the complete lack of any movement of workers for their own class interests, the strikes on Curaçao are a ray of hope in an ocean of darkness. "Curaçao will serve as a transit port for humanitarian aid to Venezuela. Together with Curaçao, the Dutch government has decided to respond to a request from the United States and interim president Juan Guaidó to turn the island into a logistics hub." Under the pretext of humanitarian aid, Curaçao's participation in the war between Maduro and Guaidó, between Russia/China/Iran/Turkey on the one hand and the United States/European Union/Netherlands on the other hand, has started.